Participating wineries and breweries include: Almquist Family Cellars, Armstrong Family Winery, Baroness Cellars, Chateau Faire Le Pont, Cloudburst Brewing, Eagle Creek Winery, Elephant Seven Winery, Four Lakes Winery, Goose Ridge Estate Winery, Icicle Ridge Winery, Icicle Brewing Co., Leony’s Cellars, Lowercase Brewing, Naked Winery, Robert Ramsay Cellars, Rocky Pond Winery, Pear Up Ciders, Pike Brewery, Stemilt Creek Winery, Villa Monaco & Wilridge Winery! More TBA Soon! Tickets are $25 with net proceeds benefiting Plymouth Housing Group. Your ticket will include 10 tasting tickets. Additional tasting tickets will be available for $2 or three for $5. Bring your own wine glass or purchase a GoVino for $3. The event will also feature noshes available from local food trucks & pig roast from Bell & Whete, live music provided by Belltown Beats and a grape stomping competition! This festival features local urban wineries and breweries, as well as a regional featured guest region, which is Cascade Valley Wine Country (Chelan, Leavenworth, Wenatchee wineries and breweries) It will be the perfect way to spend a Sunday afternoon, celebrate the Belltown community, and support a great cause. 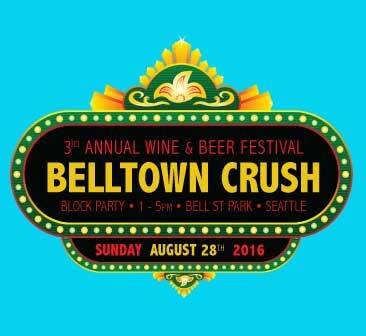 The Belltown Crush Block Party is a collaboration between the Belltown Business Association, Seattle Uncorked and Plymouth Housing Group. 1:00 to 2:00 pm SCARLET PARKE is a Soul/Pop singer with an amazing voice, very upbeat performer, and is great to watch, and will be bringing special guest Frank Vitolo on sax to join her on stage! 2:30 to 3:30 pm JASON KERTSON, a finalist on The Voice, plays originals and makes covers his own, uses a looper on vocals and guitar and puts out a lot of sound for a solo act! 4:00 to 5:00 pm CHAMPAIGN SUNDAY – This husband & wife duo is truly effervescent, and both not only stellar musicians but also theatrically trained -they will put on a show! Gary Gibson and Michael Bento became playing together after respectively leading of two of Seattle’s most active steel drum groups, combining their efforts to create Panduo, Seattle’s hottest small steel pan group!